Hundreds of stranded metro-riding Madrileños lined up at a major city bus terminal Tuesday. Photo via El Pais. Ever wonder what a day without Metro would feel like? Today, Madrileños found out. Lately we’ve talked a lot about U.S. transit agencies’ budget crises. But events in Madrid today are eye opening, showing how transit agencies around the world are facing cutbacks – and what happens when workers push back. Today, Madrid’s more than 2 million daily subway riders were left stranded when the five unions representing Madrid Metro – including the largest, Unión General de Trabajadores (UGT) and Confederación Sindical de Comisiones Obreras (CCOO) – declared a general strike to protest a 5 percent cut in Metro salaries that was passed Monday night by the regional government. Some workers already began picketing on Monday, but Metro continued providing the “minimum services” required by Spanish law, running half the normal volume of trains. While the situation on Monday was a hassle for passengers, the day reportedly passed smoothly, with a maximum delay of 15 minutes. 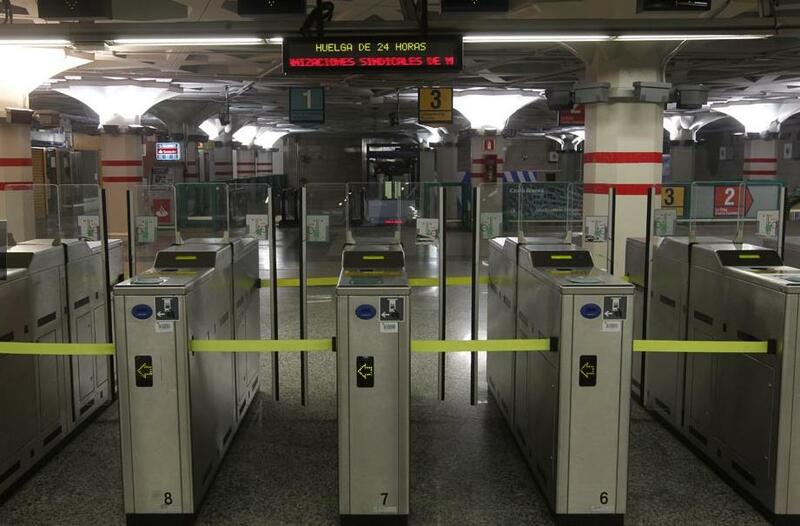 Today’s full strike signified the first time in over two decades that Madrid Metro workers broke their minimum service agreement. The city’s transit system fell into chaos. Closed turnstiles at Sol metro station, a central transit hub in Madrid. Photo via El Pais. Madrid’s Municipal Transport Company (EMT), which runs the city’s buses, reportedly collapsed this morning as stranded commuters flooded the system beyond capacity; the company’s website was saturated by confused commuters and went down for most of the day. Meanwhile, El Pais reported a 30 percent increase (compared with a normal Tuesday) in the demand for taxis, and drivers sat in gridlock as vehicle traffic increased dramatically throughout the city. On Madrid’s major inner ring road, M-30, traffic was 25 percent higher than normal between 6:30 and 8:30 Tuesday morning, according to Madrid’s Transportation Council (Ayuntamiento de Madrid). Tuesday night, El Pais’ Laura Jimenez reported watching frustrated fans struggling to make their way to some place where they could watch the Spain v. Portugal World Cup match, which began at 8:30 p.m. local time. During Tuesday's Metro strike, bus stops on the city's main north-south transit axis - like this one at Paseo del Prado - were packed throughout the day. Photo via El Pais. Getting a taxi on Tuesday also "turned into an Odyssey," as El Pais reported. 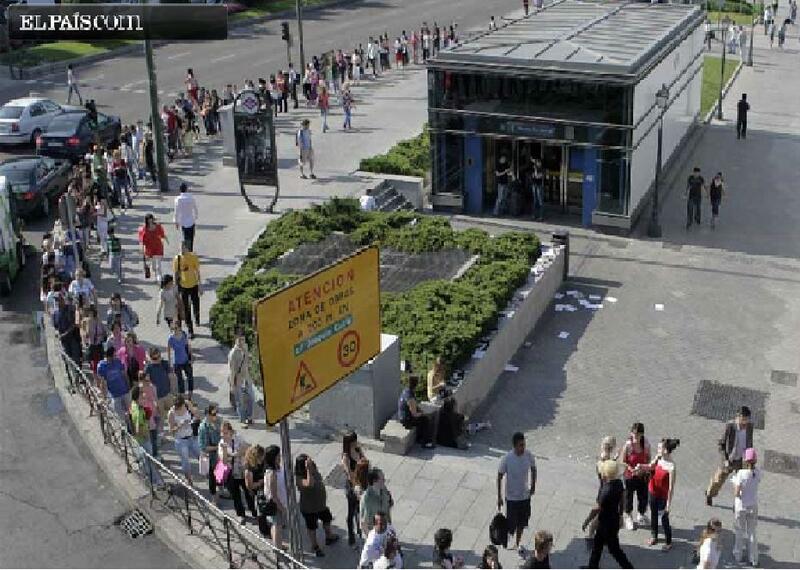 Hundreds of people lined up for taxis outside of Metro stations like Moncloa, pictured above. Photo via El Pais. Spain’s government has been struggling to respond to the global economic recession: the nation’s budget deficit reached 11.2 percent last year and unemployment is the highest in the region, at 20 percent overall and 40 percent among young people. In response, Spain’s socialist government is implementing unpopular austerity measures – including a series of public salary cuts – in an attempt to cut public spending by 15 billion euros ($18.51 billion). On Monday, Madrid’s more conservative regional government passed an “Urgent Measures Law” extending these salary cuts to employees of public companies like Madrid Metro, who would see their salaries fall by 5 percent. According to CCOO Secretary General Ignacio Fernández Toxo, this new law flouts a previous salary agreement between union leaders and Madrid’s government; so at an assembly Monday night, reportedly 4,000 Metro workers voted for a full strike, contravening minimum service agreements. Tuesday afternoon, Madrid police made a failed attempt to reopen Metro’s Line 8, which runs from Nuevos Ministerios, a transit hub near government and financial complexes, and Barajas International Airport. According to El Pais’ live coverage, the full strike will continue tomorrow, and Metro is working on a plan for private buses to cover subway routes if the strike continues indefinitely. Union leaders have declared the strike a warning of what is to come. A general strike is already planned for all public workers across Spain on September 29, 2010. But Vicente Rodríguez, Madrid Metro’s strike committee spokesperson, said that Metro workers did not want to “mix politics with the union movement,” and thus did not wait until September 29 to strike. When El Pais reminded him that the strike was only affecting the cities workers, Rodríguez responded that such strikes have always been a part of workers’ struggle to retain their rights. In the meantime, Metro’s directors warned that striking workers will suffer sanctions or be fired. The chaos in Madrid is just the latest example of how transit strikes can paralyze a city. They cause economic losses, put workers’ jobs at risk, and generate widespread frustration and political unrest. In March, Bogotá bus strikes reduced the supply of transport in the city by 16,000 buses, and strikes spread throughout the country with taxi drivers joining in, as well. And in May, Mumbaikers found themselves in a similar situation, as motormen went on strike and two-thirds of the city’s commuter trains shut down. Late last year, over 4,700 Philadelphia transit workers went on strike for six days because of similar frustration about wages, pensions, and health benefits.